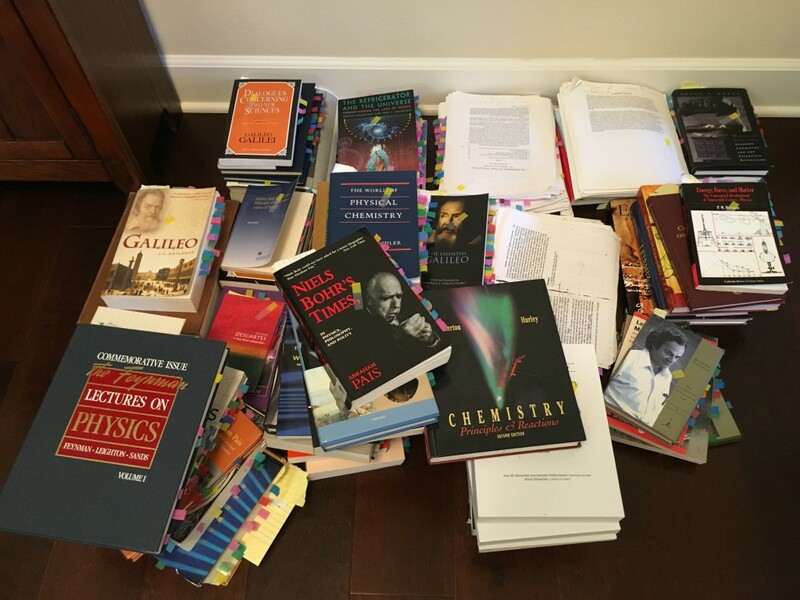 I’ve been hard at work going through all the references for my book – The Cosmic Machine: The Science That Runs Our Universe and The Story Behind It . It’s taken a bit of work, but I can say that all the books, websites, and papers that should comprise the bibliography are all accounted for now. Aitchison, Ian J. R., David A. MacManus, and Thomas M. Snyder. “Understanding Heisenberg’s ‘Magical’ Paper of July 1925: A New Look at the Calculational Details.” American Journal of Physics 72 (2004): 1370–1379. Antognazza, Maria R. Leibniz: An Intellectual Biography. New York: Cambridge University Press, 2008. Badino, Massimiliano. “Probability and Statistics in Boltzmann’s Early Papers on Kinetic Theory.” PhilSci-Archive: An Archive for Preprints in Philosophy of Science. http://philsci-archive.pitt.edu/2276/ (accessed 2016). ———. “The Odd Couple: Boltzmann, Planck and the Application of Statistics to Physics (1900–1913).” Annalen Der Physik 18 (2009): 81–101. Banach, David. “Plato’s Theory of Forms.” David Banach Homepage (Philosophy 105). http://www.anselm.edu/homepage/dbanach/platform.htm (accessed 2016). ———. “Some Main Points of Aristotle’s Thought.” David Banach Homepage (Philosophy 105). http://www.anselm.edu/homepage/dbanach/arist.htm (accessed 2016). Boas, Marie. “The Establishment of the Mechanical Philosophy.” Osiris 10 (1952): 412–541. Bose, Satyendra N. “Planck’s Law and the Light Quantum Hypothesis (Translated by O. Theimer and Budh Ram).” American Journal of Physics 44 (1976): 1056–1057. Boyle, Robert. The Sceptical Chymist. Mineola: Dover Publications, 2003. Brush, Stephen G. “How Ideas Became Knowledge: The Light-Quantum Hypothesis 1905–1935.” Historical Studies in the Physical and Biological Sciences 37 (2007): 205–246. ———. “The Development of the Kinetic Theory of Gases.” Archive for History of Exact Sciences 12 (1974): 1–88. ———. The Kinetic Theory of Gases: An Anthology of Classic Papers with Historical Commentary (History of Modern Physical Sciences, Vol. 1). London: Imperial College Press, 2003. Burnham, Douglas. “Gottfried Leibniz: Metaphysics.” The Internet Encyclopedia of Philosophy. http://www.iep.utm.edu/leib-met/ (accessed 2016). Campbell, Gordon. “Empedocles.” The Internet Encyclopedia of Philosophy. http://www.iep.utm.edu/empedocl/ (accessed 2016). Cassidy, David C. Uncertainty: The Life and Science of Werner Heisenberg. New York: W.H. Freeman, 1992. Cercignani, Carlo. Ludwig Boltzmann: The Man Who Trusted Atoms. New York: Oxford University Press, 1998. Clausius, Rudolf. The Mechanical Theory of Heat: With Its Applications to the Steam-Engine and to the Physical Properties of Bodies. Edited by Thomas A. Hirst. J. Van Voorst, 1867. Cohen, S. Marc. “Aristotle’s Metaphysics.” The Stanford Encyclopedia of Philosophy (Summer 2014 Edition). Edited by Edward N. Zalta. http://plato.stanford.edu/archives/sum2014/entries/aristotle-metaphysics/ (accessed 2016). Cottingham, John, ed. The Cambridge Companion to Descartes. Cambridge University Press, 1992. ———. The Quantum Physicists: And an Introduction to Their Physics. New York: Oxford University Press, 1970. Darrigol, Olivier. “Continuities and Discontinuities in Planck’s Akt der Verzweiflung.” Annalen der Physik 9 (2000): 951–960. ———. From c-Numbers to q-Numbers: The Classical Analogy in the History of Quantum Theory. Berkeley: University of California Press, 1992. ———. “The Historians’ Disagreements over the Meaning of Planck’s Quantum.” Centaurus 43 (2001): 219–239. ———. “The Origins of the Entropy Concept.” Edited by J. Dalibard, B. Duplantier, and V. Rivasseau. Poincaré seminar 2003: Bose-Einstein condensation, Entropy. Basel: Birkhäuser, 2004, 101–118. De Camp, L. Sprague. The Ancient Engineers: Technology and Invention from the Earliest Times to the Renaissance. New York: Sterling Publishing, 1990. Debus, Allen G. “Paracelsus, Five Hundred Years: Three American Exhibits.” U.S. National Library of Medicine. http://www.nlm.nih.gov/exhibition/paracelsus/index.html (accessed 2016). Descartes, René. Principles of Philosophy. Translated by Valentine R. Miller and Reese P. Miller. Netherlands: Kluwer Academic Publishers, 1991. Dirac, Paul A. M. “The Physical Interpretation of the Quantum Dynamics.” Proceedings of the Royal Society of London A 113 (1927): 621–641. Dobbs, Betty Jo T. The Foundations of Newton’s Alchemy. Cambridge: Cambridge University Press, 1983. Drake, Stillman. Essays on Galileo and the History and Philosophy of Science. Edited by Trevor H. Levere and Noel M. Swerdlow. Vol. 1. Toronto: University of Toronto Press, 1999. ———. Essays on Galileo and the History and Philosophy of Science. Edited by Trevor H. Levere and Noel M. Swerdlow. Vol. 2. Toronto: University of Toronto Press, 1999. ———. Essays on Galileo and the History and Philosophy of Science. Edited by Trevor H. Levere and Noel M. Swerdlow. Vol. 3. Toronto: University of Toronto Press, 2000. ———. Galileo at Work: His Scientific Biography. Mineola: Dover Publications, 1995. ———. Galileo: A Very Short Introduction. New York: Oxford University Press, 2001. Eckert, Michael. “Max von Laue and the Discovery of X-Ray Diffraction in 1912.” Annalen der Physik 524 (2102): A83–A85. Einstein, Albert. Letters on Wave Mechanics: Correspondence with H. A. Lorentz, Max Planck, and Erwin Schrödinger. New York: Open Road, 2011. ———. The Collected Papers of Albert Einstein, Volume 14: The Berlin Years: Writings & Correspondence, April 1923–May 1925 (English Translation Supplement). Edited by Diana K. Buchwald, József Illy, Ze’ev Rosenkranz, Tilman Sauer, and Osik Moses. Translated by Ann M. Hentschel and Jennifer N. James. Princeton: Princeton University Press, 2015. ———. The Collected Papers of Albert Einstein, Volume 2: The Swiss Years: Writings, 1900–1909. Translated by Anna Beck. Princeton: Princeton University Press, 1989. ———. The Collected Papers of Albert Einstein, Volume 6: The Berlin Years: Writings, 1914–1917. Translated by Alfred Engel. Princeton: Princeton University Press, 1997. Fara, Patricia. Newton: The Making of Genius. New York: Columbia University Press, 2004. Faraday, Michael. “On the Absolute Quantity of Electricity Associated with the Particles or Atoms of Matter.” Philosophical Transactions of the Royal Society of London 124 (1834): 77–122. Feynman, Richard P., Robert B. Leighton, and Matthew Sands. The Feynman Lectures on Physics: Commemorative Issue, Three Volume Set. Redwood City: Addison Wesley, 1989. ———. The Character of Physical Law. New York: Modern Library, 1994. Fitzpatrick, Richard. “Heisenberg’s Uncertainty Principle.” Quantum Mechanics. http://farside.ph.utexas.edu/teaching/qmech/Quantum/node27.html (accessed 2016). Fowler, Michael. “Evolution of the Atomic Concept and the Beginnings of Modern Chemistry.” Modern Physics. http://galileo.phys.virginia.edu/classes/252/atoms.html (accessed 2016). Galilei, Galileo. Dialogue Concerning the Two Chief World Systems: Ptolemaic and Copernican. Edited by Stillman Drake. New York: The Modern Library, 2001. ———. Dialogues Concerning Two New Sciences. Translated by Henry Crew and Alfonso de Salvio. New York: Prometheus Books, 1991. ———. On Motion and Mechanics: Comprising De Motu (ca. 1590) and Le Meccaniche (ca. 1600). Translated by I. E. Drabkin and Stillman Drake. Madison: The University of Wisconsin Press, 1960. ———. The Essential Galileo. Translated by Maurice A. Finocchiaro. Indianapolis: Hackett Publishing Company, Inc, 2008. Galilei, Galileo, and Stillman Drake. Two New Sciences/A History of Free Fall: Aristotle to Galileo. Translated by Stillman Drake. Toronto: Wall & Emerson, Inc., 2000. Gamow, George. The Great Physicists from Galileo to Einstein. Mineola: Dover Publications, 1988. Gavin, Sean, and Stephen P. Karrer. “The Living Force.” Sean Gavin’s Homepage. http://rhig.physics.wayne.edu/~sean/Sean/Course_information_files/VisViva.pdf (accessed 2016). Gearhart, Clayton A. “Planck, the Quantum, and the Historians.” Physics in Perspective 4 (2002): 170–215. Georgia State University. HyperPhysics. http://hyperphysics.phy-astr.gsu.edu/hbase/hph.html (accessed 2016). Gindikin, Semyon G. Tales of Physicists and Mathematicians. Translated by Alan Shuchat. Boston: Birkhäuser, 1988. Goldstein, Martin, and Inge F. Goldstein. The Refrigerator and the Universe: Understanding the Laws of Energy. Cambridge: Harvard University Press, 1995. Graham, Daniel W. “Anaximenes.” The Internet Encyclopedia of Philosophy. http://www.iep.utm.edu/anaximen/ (accessed 2016). Gribbin, John. Erwin Schrödinger and the Quantum Revolution. Hoboken: Wiley, 2013. Hankins, Thomas L. “Eighteenth-Century Attempts to Resolve the Vis Viva Controversy.” Isis 56 (1965): 281–297. Harman, Peter M. Energy, Force and Matter: The Conceptual Development of Nineteenth-Century Physics. Cambridge University Press, 1982. Heilbron, John L. Galileo. Oxford: Oxford University Press, 2012. Heisenberg, Werner. Encounters with Einstein: And Other Essays on People, Places and Particles. Princeton: Princeton Science Press, 1989. ———. The Physical Principles of the Quantum Theory. Translated by Carl Eckart and F.C. Hoyt. Mineola: Dover Publications, 1949. Holmyard, Eric J. Alchemy. Mineola: Dover Publications, 1990. Holton, Gerald, and Stephen G. Brush. Physics, the Human Adventure: From Copernicus to Einstein and Beyond. Rutgers University Press, 2001. Iltis, Carolyn. “Bernoulli’s Springs and their Repercussions in the Vis Viva Controversy.” Actes du XIIIe Congrès International d’Histoire des Sciences. Moscow, 1974. 309–315. ———. “D’Alembert and the Vis Viva Contoversy.” Studies in History and Philosophy of Science 1 (1970): 135–144. ———. “Leibniz and the Vis Viva Controversy.” Isis 62 (1971): 21–35. ———. “The Controversy Over Living Force: Leibniz to D’Alembert (Doctoral Dissertation).” http://nature.berkeley.edu/departments/espm/env-hist/dissertation.html (accessed 2016). Isler, Martin. Sticks, Stones, & Shadows: Building the Egyptian Pyramids. Oklahoma: University of Oklahoma Press, 2001. Janiak, Andrew. “Newton’s Philosophy.” The Stanford Encyclopedia of Philosophy (Summer 2014 Edition). Edited by Edward N. Zalta. http://plato.stanford.edu/archives/sum2014/entries/newton-philosophy (accessed 2016). Jones, Sheilla. The Quantum Ten: A Story of Passion, Tragedy, Ambition, and Science. New York: Oxford University Press, 2008. Klein, Martin J. “Einstein’s First Paper on Quanta.” The Natural Philosopher 2 (1963): 59–86. ———. “Planck, Entropy, and Quanta, 1901–1906.” The Natural Philosopher 1 (1963): 83–108. ———. “Thermodynamics in Einstein’s Thought.” Science 157 (1967): 509–516. Kleppner, Daniel. “Rereading Einstein on Radiation.” Physics Today, 2005: 30–33. ———. The Structure of Scientific Revolutions. 4th ed. Chicago: University of Chicago Press, 2012. Laidler, Keith J. The World of Physical Chemistry. Oxford: Oxford University Press, 1995. Lau, Katherine I., and Kim Plofker. “The Cycloid Pendulum Clock of Christiaan Huygens.” In Hands on History: A Resource for Teaching Mathematics, edited by Amy Shell-Gellasch, 145–152. Washington, DC: Mathematical Association of America, 2007. Leibniz, Gottfried W. Leibniz: Philosophical Essays (Hackett Classics). Translated by Roger Ariew and Daniel Garber. Indianapolis: Hackett Publishing Company, 1989. Linden, Stanton J. The Alchemy Reader: From Hermes Trismegistus to Isaac Newton. Cambridge: Cambridge University Press, 2003. Lindsay, Robert B. “The Concept of Energy and Its Early Historical Development.” Foundations of Physics 1 (1971): 383–393. Loschmidt, Johann. “On the Size of the Air Molecules.” Edited by William W. Porterfield and Walter Kruse. Journal of Chemical Education, 1995: 870–875. Müller, Ingo. A History of Thermodynamics: The Doctrine of Energy and Entropy. Berlin: Springer Berlin Heidelberg, 2007. MacDougal, Douglas W. Newton’s Gravity: An Introductory Guide to the Mechanics of the Universe. New York: Springer, 2012. Mach, Ernst. History and Root of the Principle of the Conservation of Energy. Translated by Philip E. B. Jourdain. Chicago: Open Court Publishing Company, 1911. Machamer, Peter. “Galileo Galilei.” The Stanford Encyclopedia of Philosophy (Winter 2014 Edition). Edited by Edward N. Zalta. http://plato.stanford.edu/archives/win2014/entries/galileo (accessed 2016). Mahoney, Michael S. “Christiaan Huygens, The Measurement of Time and Longitude at Sea.” In Studies on Christiaan Huygens, edited by H. J .M. Bos, J. S. Rudwick, H. A. M. Melders, and R. P. W. Visser, 234–270. Lisse: Swets & Zeitlinger, 1980. Maxwell, James C. “Molecules.” Nature VIII (1873): 437–441. ———. “The Theory of Molecules.” Popular Science Monthly 4 (1874): 276–290. McDonough, Jeffrey K. “Leibniz’s Philosophy of Physics.” The Stanford Encyclopedia of Philosophy (Spring 2014 Edition). Edited by Edward N. Zalta. http://plato.stanford.edu/archives/spr2014/entries/leibniz-physics (accessed 2016). Mehra, Jagdish, and Helmut Rechenberg. The Historical Development of Quantum Theory, Vol. 4: Part 1: The Fundamental Equations of Quantum Mechanics 1925–1926; Part 2: The Reception of the New Quantum Mechanics 1925–1926. New York: Springer-Verlag, 2001. ———. The Historical Development of Quantum Theory, Vol. 5: Erwin Schrödinger and the Rise of Wave Mechanics. Part 2: The Creation of Wave Mechanics: Early Response and Applications 1925–1926. New York: Springer-Verlag, 2001. Meldrum, Andrew N. Avogadro and Dalton: The Standing in Chemistry of Their Hypotheses. University of Aberdeen, 1904. Meyer, Joseph. “Roman Siege Machinery and the Siege of Masada.” 2012 AHS Capstone Projects, Paper 14, 2012. Moore, Walter J. Schrödinger: Life and Thought. New York: Cambridge University Press, 1992. Moran, Bruce T. Distilling Knowledge: Alchemy, Chemistry, and the Scientific Revolution. Cambridge: Harvard University Press, 2005. Muir, Matthew Moncrieff Pattison. A History of Chemical Theories and Laws. New York: Wiley, 1907. Myers, Richard L. The Basics of Chemistry. Westport: Greenwood Press, 2003. Newburgh, Ronald, Joseph Peidle, and Wolfgang Rueckner. “Einstein, Perrin, and the Reality of Atoms: 1905 Revisited.” American Association of Physics Teachers 74 (2006): 478–481. Newman, William R. Atoms and Alchemy: Chymistry and the Experimental Origins of the Scientific Revolution. Chicago: University Of Chicago Press, 2006. ———. “Alchemy vs. Chemistry: The Etymological Origins of a Historiographic Mistake.” Early Science and Medicine 3 (1998): 32–65. Newton, Isaac. The Principia. Translated by Andrew Motte. New York: Prometheus Books, 1995. O’Connor, John J., and Edmund F. Robertson. “Louis Victor Pierre Raymond duc de Broglie.” The MacTutor History of Mathematics Archive. http://www-history.mcs.st-andrews.ac.uk/Biographies/Broglie.html (accessed 2016). O’Keefe, Tim. “Epicurus.” The Internet Encyclopedia of Philosophy. http://www.iep.utm.edu/epicur/ (accessed 2016). O’Raifeartaigh, Lochlainn. The Dawning of Gauge Theory. Princeton: Princeton University Press, 1997. Pais, Abraham. The Genius of Science: A Portrait Gallery of Twentieth-Century Physicists. New York: Oxford University Press, 2000. ———. Inward Bound: Of Matter and Forces in the Physical World. New York: Oxford University Press, 1988. ———. Niels Bohr’s Times: In Physics, Philosophy, and Polity. New York: Oxford University Press, 1993. ———. Subtle Is the Lord: The Science and the Life of Albert Einstein. New York: Oxford University Press, 1982. Patzia, Michael. “Anaxagoras.” The Internet Encyclopedia of Philosophy. http://www.iep.utm.edu/anaxagor/ (accessed 2016). Principe, Lawrence M. “Reflections on Newton’s Alchemy in Light of the New Historiography of Alchemy.” In Newton and Newtonianism: New Studies, edited by James E. Force and Sarah Hutton, 205–19. Dordrecht: Kluwer Academic Publishers, 2004. Purrington, Robert D. Physics in the Nineteenth Century. New Brunswick: Rutgers University Press, 1997. Robinson, Andrew. Einstein: A Hundred Years of Relativity. New York: Harry N. Abrams, Inc, 2005. Ross, Sydney. “John Dalton.” Encyclopædia Britannica Online. http://www.britannica.com/EBchecked/topic/150287/John-Dalton/217770/Atomic-theory (accessed 2016). Rubenstein, Richard E. Aristotle’s Children: How Christians, Muslims, and Jews Rediscovered Ancient Wisdom and Illuminated the Middle Ages. Orlando: Harcourt, 2004. Ryckman, Thomas. The Reign of Relativity: Philosophy in Physics 1915–1925. New York: Oxford University Press, 2005. Scerri, Eric R. The Periodic Table: Its Story and Its Significance. New York: Oxford University Press, 2007. Schmaltz, Tad M. Descartes on Causation. New York: Oxford University Press, 2013. Schrödinger, Erwin. Collected Papers on Wave Mechanics. Translated by J.F. Shearer and W.M. Deans. Providence: AMS Chelsea Publishing, 1982. ———. “On Einstein’s Gas Theory (English Tranlsation by T. C. Dorlas).” Teunis (Tony) C. Dorlas Homepage. http://homepages.dias.ie/dorlas/Papers/schrodinger_gas.pdf (accessed 2016). Shapin, Steven. The Scientific Revolution. Chicago: University of Chicago Press, 1998. Slowik, Edward. “Descartes’ Physics.” The Stanford Encyclopedia of Philosophy (Summer 2014 Edition). Edited by Edward N. Zalta. http://plato.stanford.edu/archives/sum2014/entries/descartes-physics/ (accessed 2016). Smith, George E. “The Vis Viva Dispute: A Controversy at the Dawn of Dynamics.” Physics Today 59 (2006): 31–36. Sorell, Tom. Descartes: A Very Short Introduction. Oxford: Oxford University Press, 2000. Stokes, Philip. Philosophy: 100 Essential Thinkers. New York: Enchanted Lion Books, 2005. Straub, William O. “On the Failure of Weyl’s 1918 Theory.” viXra.org e-print archive. http://vixra.org/abs/1401.0168 (accessed 2016). Terrall, Mary. “Vis Viva Revisited.” History of Science 42 (2004): 189–209. Uffink, Jos. “Boltzmann’s Work in Statistical Physics.” The Stanford Encyclopedia of Philosophy (Fall 2014 Edition). Edited by Edward N. Zalta. http://plato.stanford.edu/archives/fall2014/entries/statphys-Boltzmann/ (accessed 2016). van der Waerden, Bartel L. Sources of Quantum Mechanics. Mineola: Dover Publications, 2007.
van Melsen, Andrew G. From Atomos to Atom: The History of the Concept Atom. Mineola: Dover Publications, 2004. Westfall, Richard S. Never at Rest: A Biography of Isaac Newton. New York: Cambridge University Press, 1983. Weyl, Hermann. Mind and Nature: Selected Writings on Philosophy, Mathematics, and Physics. Edited by Peter Pesic. Princeton: Princeton University Press, 2009.